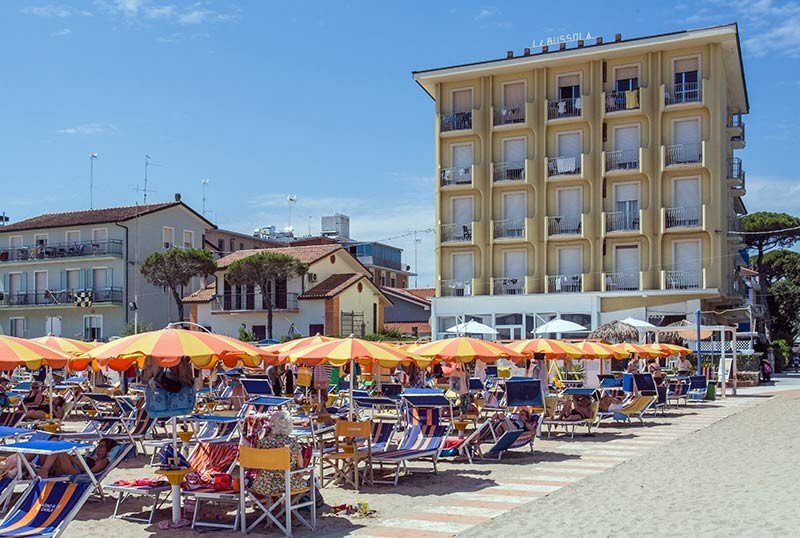 Hotel La Bussola is a 3-star hotel on the beach of Bellaria, to which it has direct access. It has parking, WI-FI and a pleasant terrace with Jacuzzi. It is ideal for families and recently renovated. Accept small animals. The hotel enjoys a privileged position, directly on the beach of Bellaria, with direct access. It is located in the central area, a few steps from the Isola dei Platani, a place full of shops, cafes, amusement arcades and clubs. The hotel's colorful and modernly furnished rooms have pleasant beach views. All rooms have a balcony (some with sea view), satellite TV, WI-FI, air conditioning, safe, minibar and new bathrooms with shower and hairdryer. The structure is characterized by the presence of a pleasant terrace with Jacuzzi and sea views, from which you have direct access to the beach. It has a open-air porch, free use of bicycles even with child seats, reading room, elevator and beach towel available, welcome drink, shuttle service to the airport and station, theme nights. BREAKFAST: international buffet breakfast with a wide selection of desserts and savory products. LUNCH AND DINNER: the cuisine is based on the local gastronomic tradition. With meals you can choose between 3 different meat and fish menus, accompanied by local wines and fresh vegetable buffet. Pasta and desserts are homemade and drinks are included. OTHER: every evening at 10 pm a snack is offered with hot ring-shaped cake, piada and nutella, donut and marinara mussels. In hotel: strollers, children's pool, entertainment. At meals: high chairs, baby food, baby menu, bottle warmer, afternoon snack. The hotel has an agreement with Bagno Carla n. 30, equipped with entertainment and children's pool. Now is the most convenient time to book your summer holidays. If you book your summer holidays from June 1st to August 31st by April 30th, you will receive a 5% discount on the list price or you can choose a beautiful gift to take advantage of during your holiday. Request information and a personalized quote. BOOK NOW! THE MOST BEAUTIFUL ROOM IS YOUR! February is the right month to book! Anticipate everyone and find out why! Book the best rooms at the best price, if you choose to book now your holidays you have an exclusive gift, save by booking now and choose the best room for!